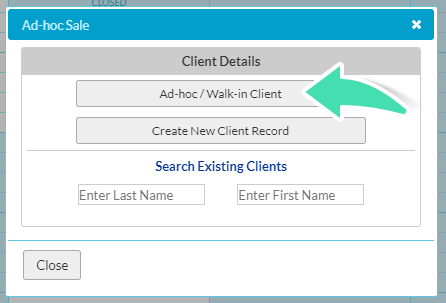 This article explains how to create Invoices for Ad-hoc sales and Walk-In Clients without creating a Client Profile or an Appointment. Be careful with this option because it is harder to keep track of Ad-hoc Invoices as they can’t be found in the Clients section. See Keeping Track of Ad-hoc Invoices for assistance in managing Invoices that are not linked to a Client. We recommend generating Invoices from Appointments or Client Accounts when possible to ensure smooth invoice management. For more assistance with this, see: Generating an Invoice from an Appointment in the Diary or Generating an Invoice from the Accounts Screen. 1. Go to the Diary page. 2. 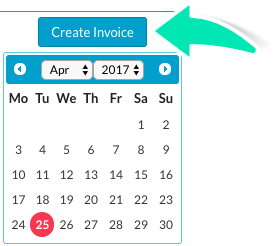 Click Create Invoice on the top left of the Diary page. a. Creating an Ad-hoc/Walk-in Invoice with no connection to a Client. b. Creating a Client to invoice. c. Creating an invoice for an Existing Client by searching for them using their Last Name or First Name. 2. /in the New Invoice screen, select the Item to invoice by finding it in the dropdown menu, start typing the item’s name to filter the item list. 3. Enter the Client’s Name at the top of the invoice. At this stage, the system will not try to find an existing Client with the same name and it won’t create a record for this Client so make sure you only want to create this as a single Invoice for this Client to avoid any confusion. 4. Add a Provider (and Provider Number) by clicking on the appropriate boxes at the top of the invoice if relevant. 5. Once these steps have been completed, change the Quantity and Price, add more Items, record a Payment, add Comments, or Save/Email/Print the Invoice as relevant. For more assistance doing so, see Generating an Invoice From an Appointment on the Diary from step 5 onwards. 1. 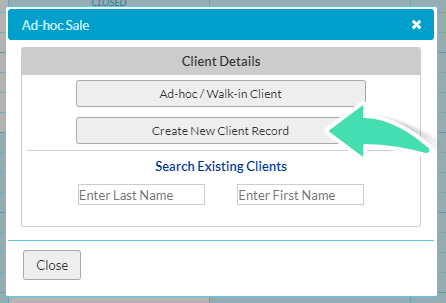 Click Create New Client Record. 2. Enter Client’s details in the Ad-hoc Sale window that opens. 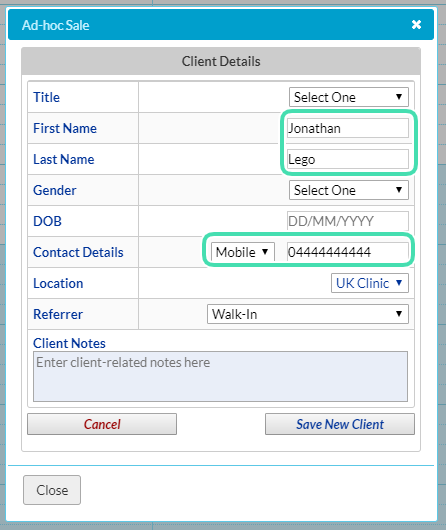 The First Name, Last Name and Contact Details are required to create the new client. 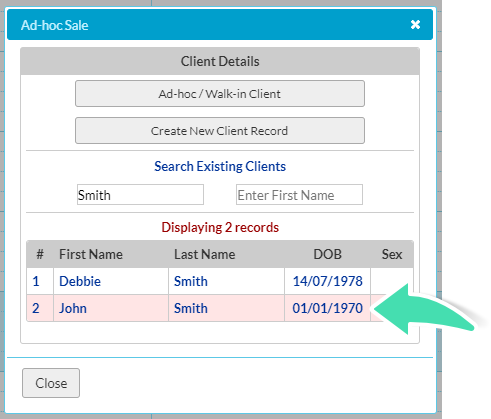 At this stage, the system will not try to find an existing Client with the same name so make sure this client doesn’t already exists in your database to avoid creating a duplicate. 3. Click Save New Client. 4. Once these steps have been completed, a New Invoice window will open to create your Invoice. From then, the same steps as Generating an Invoice from the Accounts Screen apply from Step 3 onwards. An Invoice can’t be linked to an Appointment if it hasn’t been generated from the appointment initially so we don’t recommend creating Ad-hoc Invoices for a Booking such as a Service or a Class. 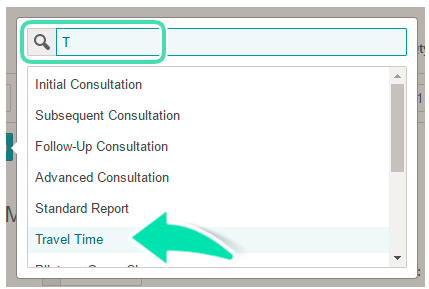 See Generating an Invoice from an Appointment in the Diary for more details to generate an Invoice from an Appointment. 1. 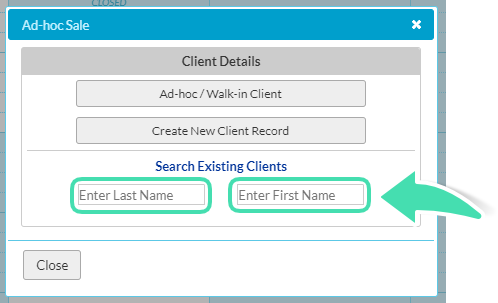 Enter Client First Name or Last Name. 2. Click on the Name of the Client. 3. Once these steps have been completed, a New Invoice window will open. From then, the same steps as Generating an Invoice from the Accounts Screen apply from Step 3 onwards.